Sea Ray, in an extravagant indoor on-water display, showcased its new 510 Flybridge motoryacht and 350 SLX sportboat. Music, strobe lights and fireworks filled the air. The boats were in the water at the Bahia Mar, but under a glass tent. It was quite the gala. I pulled aside Ron Berman, vice president of product development and engineering for Brunswick, the parent company of Sea Ray, to find out more about the 510 Fly and 350 SLX. He reminded me that the company also has a new 260 Sundancer. 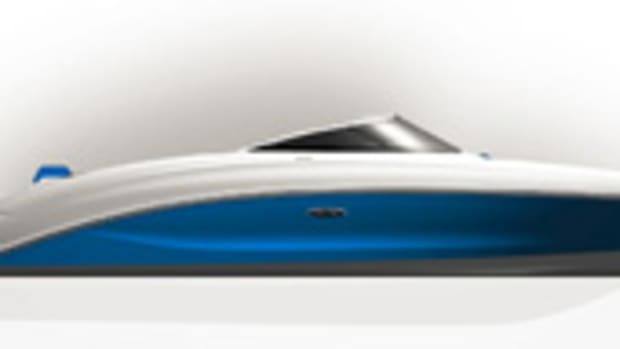 The 350 SLX is the largest bowrider Sea Ray has ever built. Berman said it can seat 18 people. Twin MerCruiser 350 Mag sterndrives power the boat. Sea Ray designed it with plenty of seats and lounges and a sizable head. The boat also has a sunroof and a retractable cockpit sunshade. The 350 SLX and 510 Flybridge are both new from the keel up, Berman said. They do not use the same hulls as the 510 or 350 Sundancer. “Right now, Sea Ray is investing probably at the highest levels in the history of the company,” Berman said. The 510 is powered with standard Cummins QSC 600 V-drives. The skipper pilot the boat with a new joystick docking system from Cummins that controls the inboards and a bow thruster. Zeus pods are also available.